When the Podgorze district became part of the Jewish Ghetto, many Germans established businesses in the area trying to profit from the Nazi occupation of Poland. Oskar Schindler was one of them. His story were made famous by Spielberg’s film ‘Schindler’s List’. 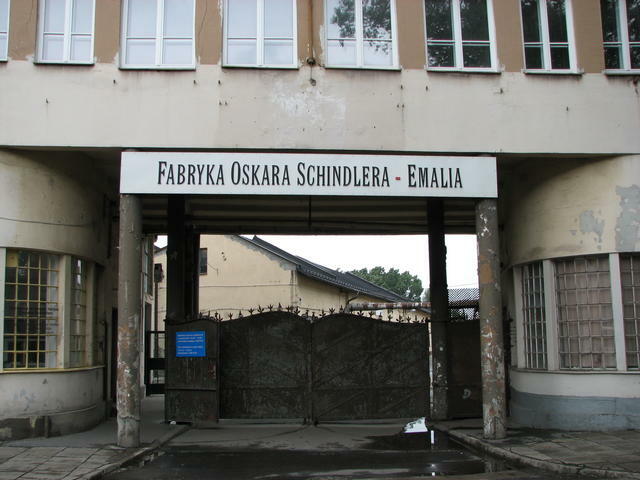 He took over the enamelware factory ‘Emalia’ that was previously in the hands of Jewish owners. He made a fortune by exploiting the cheap Jewish labour. But the Nazi regime changed Schindler from a businesman concentrated on making profits to a hero saving Jewish workers at personal expense. During the Krakow ghetto liquidation he saw many of his workers die. Since then he did whatever he could to protect his workers. He saved the lives of over 1,100 Jews working in his factory, often at great risk to his own life. By the end of the war, Schindler had spent his entire fortune on bribes in order to improve his workers living conditions or save them from being killed. After the war all of his businesses failed one after another. He died at the age of 66. He wanted to be buried in Jerusalem. He is the only Nazi party member buried on the Mount Zion. The fabled Oskar Schindler’s factory has been turned into a museum devoted to the wartime experiences in Krakow under the five-year Nazi occupation during the World War II.